Wellness and preventive care is the foundation to a long, healthy life for your pet. We recommend all pets have annual physical examinations for many reasons. 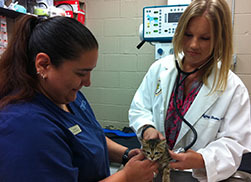 Pet wellness care helps to prevent medical conditions, provide maintenance services and discuss at-home care. By bringing your adult pet in annually and your senior pet in biannually for wellness care, you’ll help your four-legged friend live longer and happier. A good life is exactly what we want for our patients in San Antonio and surrounding communities. Schedule your pet’s wellness exam today! A complete physical from nose-to-tail is the best way to catch health problems in your pet early. This gives us time to administer treatment before medical conditions have fully developed. Yearly pet wellness care is the perfect opportunity to provide maintenance services, preventative care and answer important questions about your pet’s health. We would love to hear any questions or concerns that have arisen about your pet. After all, you are more familiar with your pet’s day-to-day routines and changes than anyone else. Open communication helps us to provide complete care for your pet. Once your pet reaches their senior years around age 7, it’s important to schedule biannual examinations for them. As your pet grows older, their needs begin to change. Even if they’ve received complete veterinary care throughout their lifetime, they may need more care when they reach their senior years. As with humans, older animals will begin to experience physical changes and we will often see the onset of age-related conditions. At Affordable Pet Care Basse, we perform senior-focused diagnostics in addition to nose-to-tail examinations to ensure that we catch potential health problems early and begin treating them before they’ve developed into something more serious. When your pet receives the proper care they need, we increase their quality of life and even help lengthen their lifespan! If your pet is approximately seven years of age or older, please talk with our team about scheduling a senior wellness exam. A longer lifetime is within reach!